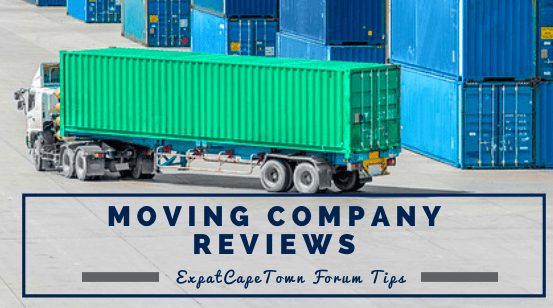 On this page about moving company reviews, our ExpatCapeTown Facebook group members, share their insights and feedback about their moving experiences when moving to South Africa. Their tips and advice shall help making the moving process a less stressful experience. Here we will also share information and answers to the most frequently asked questions regarding relocating to Cape Town, that were posted on our Expat Cape Town forum on facebook. The feedback and moving company reviews shall help you choose a reliable moving company for your relocation to Cape Town. Remember that these posts were shared on our Facebook forum and there are other reliable companies serving the market. Does anyone have any recommendations of companies to use (or avoid) for shipping from the UK to SA? Who is the best removal companies for my move to Cape Town? Which company did you use for your move to South Africa? I used pickfords as they were a well known company initially. Also there is a pickfords international here and so all hand overs are with the same company. Delivery including waiting for customs clearance was about 3 weeks and all went very smoothly, very professional. I have heard horror stories of using different companies in UK ans SA where things have gone missing in the hand over plus problems with 2 differents lots of paperwork. Cant remember the cost off hand, think we had a 20ft container. They were not the cheapest but then again not the most expensive. Hope this helps. We use Elliott, they are great. Santa Fe is the Best. Zero breakage even on glasses! Just wanted to share such a good experience with a removal / relocation company called Santa Fe. We used them from France to here and also from Pretoria to Cape Town and there was so even a glass broken!! Service was top notch! A friend is also nowmoving back to France with them. Very well priced and great service. I was disappointed with biddulphs. I also used biddulphs a few years ago took 3 months to get here via ship. But all went well. I'm in the process of having my goods shipped by Interdean from the UK. So far the experience has been largely positive. Feel free to DM if you want more detail. We used Hunts and they lost one of our boxes and refused to accept that it was not delivered. Their insurance also screwed us over. I just used Dolphin Movers in London and Biddulphs on the Cape Town side, couldn't have been happier! Especially with Biddulphs, they were so lovely and helpful. Good luck with finding the right fit for you. Happy to share more info if you pm me. I've been using Anglopacific to send some household bits to South Africa more than once. Both times it ended up on a Maersk ship and got to Cape Town in somewhere under 2 months, with Biddulphs doing the clearing in SA. It involves a bit of paperwork to take past the police and the SARS office in town for the customs clearning, but that only took me an hour the last time I did it. Can anyone advise on how to/which company is best for getting approx. 5 suitcases/removal boxes to the UK? I am looking to move around 140 kg./27m3 of random stuff and furniture from Bangkok to Cape Town. Can anyone recommend a reputable, reasonably priced courier or a movers company? Disclaimer on moving company reviews: These above mentioned reviews relate to personal experiences made by ExpatCapeTown forum members. We do not allow promotional ads on the forum and thus do not accept any comments or recommendations by group members should we know about any affiliation with related businesses interests. We do not accept responsibility for any consequence, loss, injury, damage or inconvenience sustained by any person using our website, blog and forum as a reference.